The Ultimate in Catch and Release. You may well think that it is at times pretty tricky to safely let go a 12” trout, fins catch in net mesh, fingers get speared by barbless hooks and you take great care to ensure that your quarry is returned unharmed, well rested and in full possession of their faculties. So have a think about this. 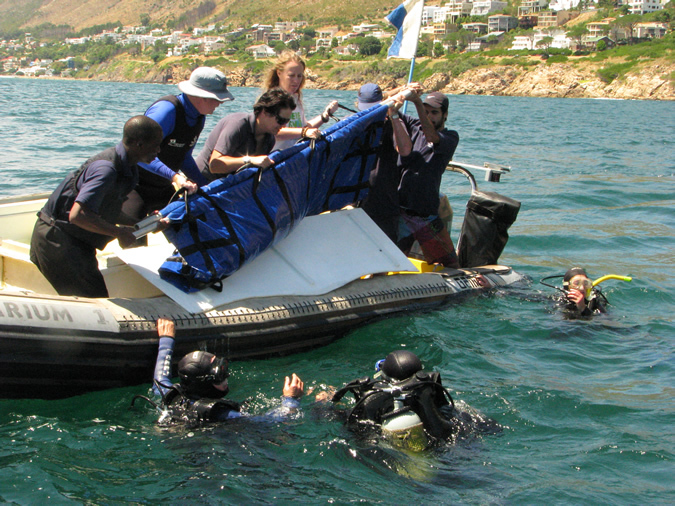 On Wednesday the Two Oceans Aquarium, www.aquarium.co.za, transported and released two Ragged Tooth Sharks in Gordon’s Bay. Mandy and Noodle had served their time helping educate the public with respect to the beauty and importance of sharks in our environment. Mandy outside of East London in Feb 2009 and Noodle in Struisbaai in April 2008, both were now going home. Released to join their compatriots on what appears to be an annual migration North towards Durban. I was privileged to be able to participate in their release and quite some operation it was. Moving two aquatic animals weighing in the region of 170Kgs each isn’t for the feint hearted or the disorganized for that matter. The fish were sedated in their holding tanks to both reduce stress to themselves and provide some measure of safety for the team working with them. They were then hoisted out of the holding tank, weighed, tagged, measured and lowered an entire story to the waiting tank truck for the journey along the N2 to Gordon’s Bay. 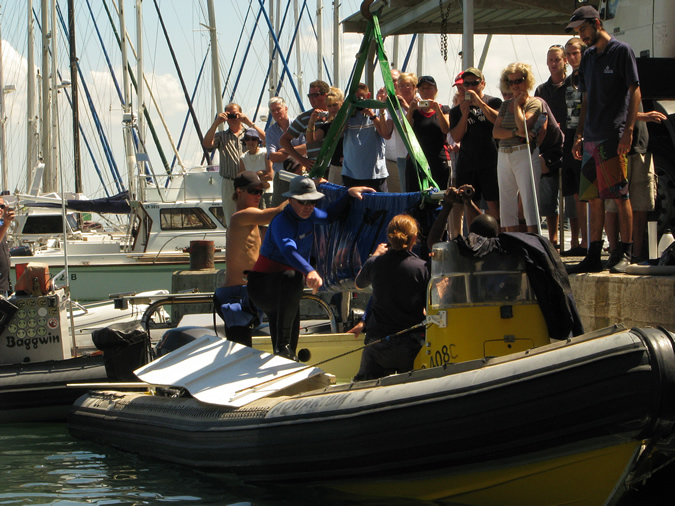 At the harbour their level of sedation was checked and first Noodle and then Mandy were lifted by crane onto the support boat into a shallow tank for the final leg of their trip to deep water off Rooi Els. Divers in the water helped support the sharks for the first few moments until such time as the clean water flushed the last remnants of sedative from their systems and they were able to make their way into the ocean depths.. what a special moment.. 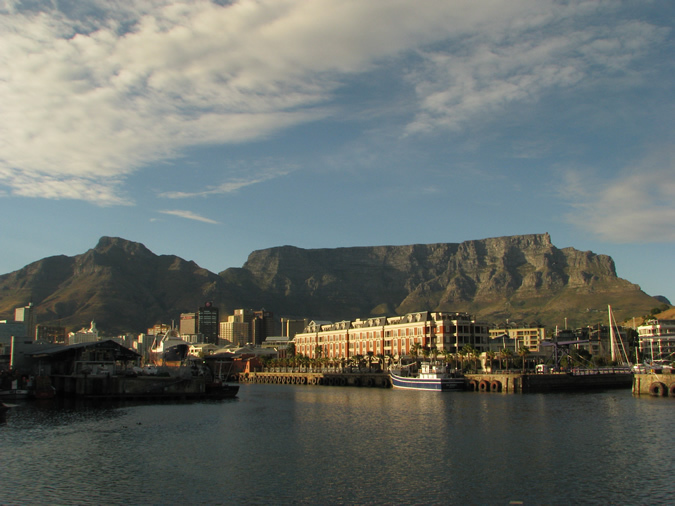 Dawn in Cape Town, Ragged Tooth Sharks "Raggies", Mandy and Noodle will be transported from the Two Oceans Aquarium in the shadow of Table Mountain and released back into the ocean. Dawn at the V & A Waterfront in Cape Town South Africa. The Two Oceans aquarium has been temporary home to Ragged Tooth Sharks Mandy and Noodle for the past year or so, it is now time for them to go home. Back into the ocean and what will probably be a leisurely trip along the coast, heading north for the winter. Noodle is helped into the sling to start her journey. 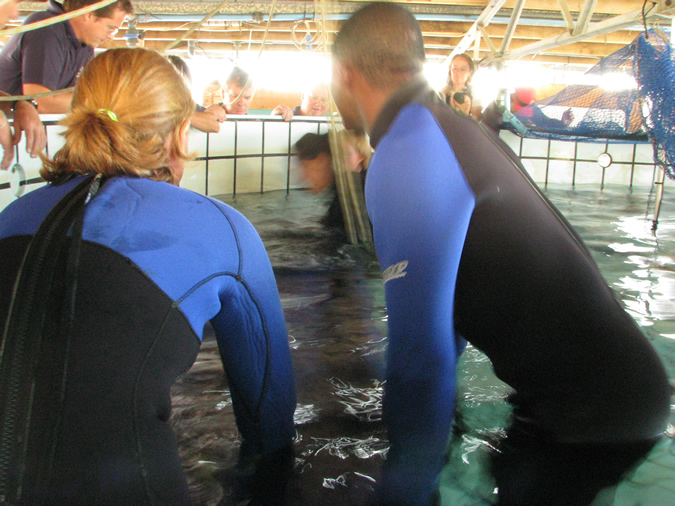 First step, the sedated sharks are removed from their temporary holding tank in preparation for weighing, measuring and tagging. Both the “Girls” had put on some weight from the fine seafood dining at the waterfront. 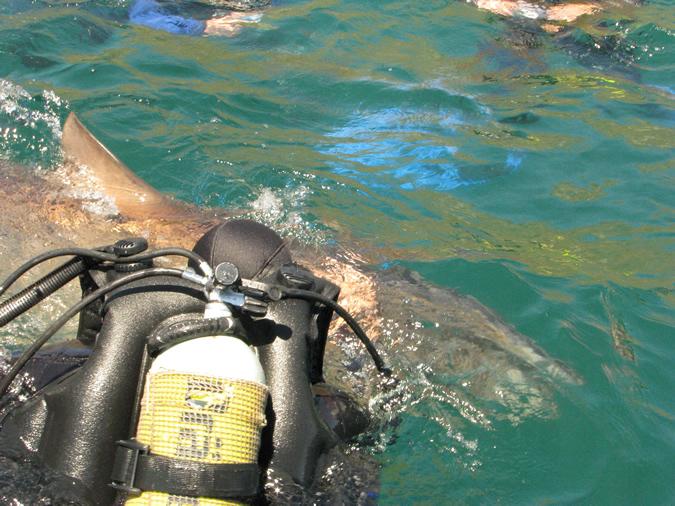 The sharks were removed from the tank in a specially designed harness. 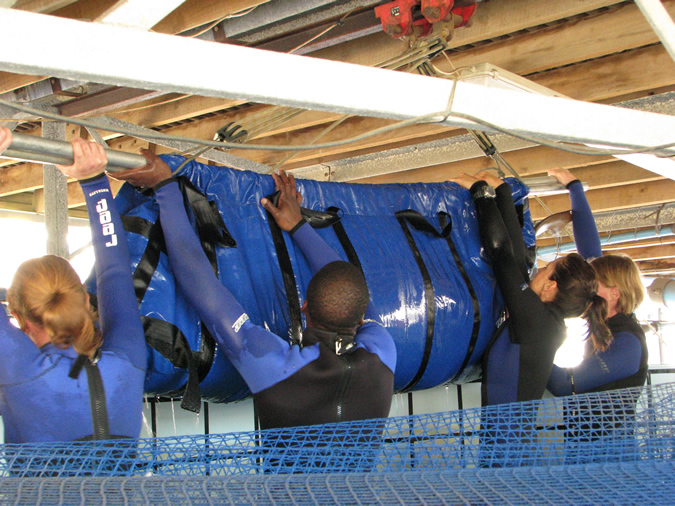 The sharks are lifted out of the holding tank in a special sling, measured weighed and tagged before being lowered to the ground floor of the aquarium into the waiting tank truck for transportation to Gordons Bay Harbour. A very large mobile goldfish pond, with some pretty special goldfish. The sedated sharks are lowered into the tank truck and ready for the road trip part of their journey. At the harbour the process is repeated and the sharks are lowered by crane into a small tank in the waiting boat. 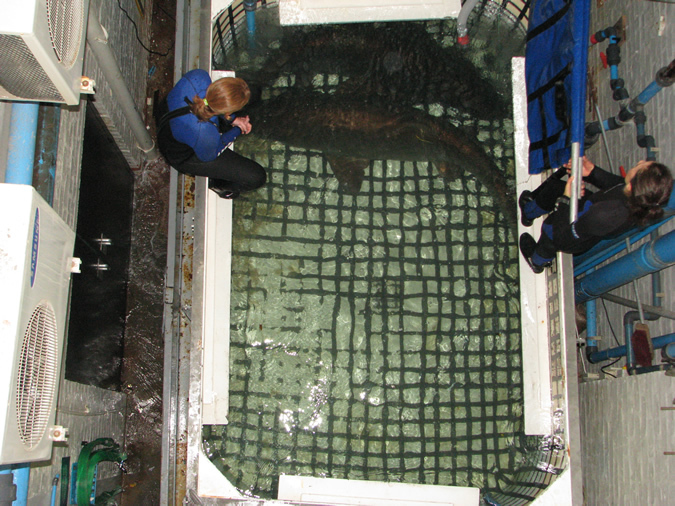 The sharks are lifted by crane truck and lowered into a small tank on the waiting Two Oceans Aquarium boat. They are but a short boat trip from freedom. A slightly undignified return to the ocean but freedom is only moments away. After a short boat ride the sharks are lifted manually from the small holding tank and released into the sea. A team of divers is on hand to swim with the sharks to insure that they have worn off the effects of the sedative and are able to balance their buoyancy properly before the fish swim off into the depths. Goodbye Mandy, a breath of fresh sea water to flush out the sedative and Mandy is on her way. One last affectionate pat from the divers and Mandy is ready to leave. WHY WERE THESE SHARKS IN THE AQUARIUM IN THE FIRST PLACE? Mandy and Noodle were part of an ongoing programme to educate the public about sharks, to allow them to get a new perspective on these magnificent apex predators and to recognise their perfection and beauty. Most people are wholly unaware of the importance or sharks to our environment or for that matter to the wholesale slaughter of these wonderful creatures at the hand of mankind.. Humans Kill Millions of Sharks Every Year. 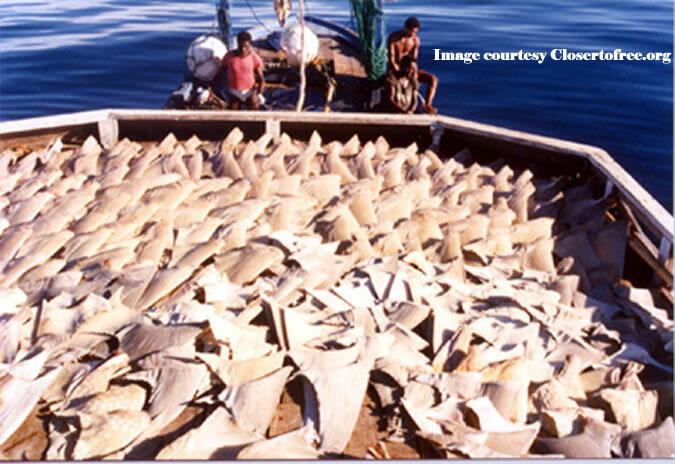 Humans kill a hundred million sharks a year, many simply having their fins chopped off for the shark fin soup industry, only to be thrown, still alive, back into the water to an agonizing and unnecessary end. South African will host the FIFA World Cup this year. If we chopped off the arms and legs of all the spectators at all the games during the tournament we still wouldn’t come close to the numbers of sharks similarly damaged. The average stadium will house 70 000 spectators, violently removing the limbs of the spectators we would need to keep going for a thousand games of soccer with full house capacity to reach the target of a hundred million or so. When you think of it in those terms the mans callous disregard for the oceans in general and sharks in particular become all the more horrifying. Think of these as arms and legs, maybe you will get the picture. Why should this appear on a fishing blog? Because I like to think that many, although sadly not all, fishermen are at least in part conservationists. Hopefully the efforts of the Two Oceans Aquarium Crew will serve as inspiration to us all to take care of our fish stocks and our aquatic environments, both fresh and saltwater. There are detractors to catch and release, there are even countries where it is banned but I would be willing to bet that in many of those countries you can still buy a tin of shark fin soup. We can only look after the planet one person at a time, one animal at a time, one decision at a time, so take some solace in knowing that there are people out there doing good for this planet and you as an angler can contribute to that process without having to give up on your sport. Fish Catch and Release, use barbless hooks, carry a soft mesh net when you are fishing to minimize damage to the fish. Take care to revive them properly before letting them go and avoid fishing for cold water species such as trout if the water temperature gets too high. Sport fishing isn’t incompatible with looking after our planet but it does require some commitment and maybe a change of outlook for some. 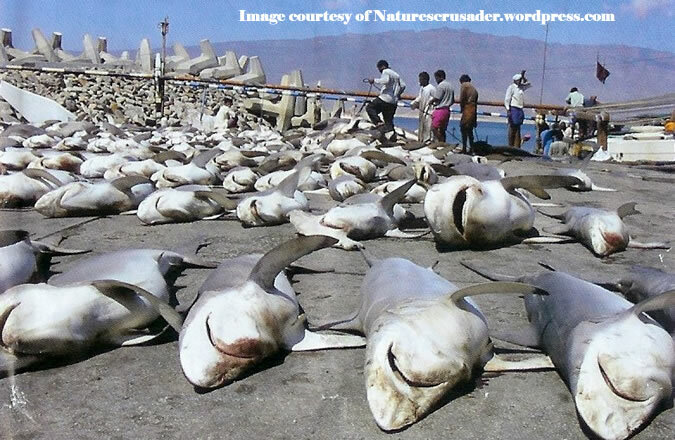 The World Wildlife Fund estimate that one hundred million sharks are killed annually. This post contains approximately 5000 letters. ONE SHARK IS KILLED FOR EVERY LETTER ON THIS PAGE EVERY HALF AN HOUR. The Dog Days can be tough but also rewarding. Right now we are in the dog days of summer, low water, tricky trout, bright sunshine and blue skies, none of which is conducive to the best in stream fly fishing. Add to that the fact that yours truly dislocated the shoulder in his casting arm and options become severely limited. Sure I have been out on the water guiding clients and they have had to work particularly hard for their fish, the only good thing about it is that the trout you get you earned and you can be as proud of your 12” beauty in Feb as you were with the 19” fish that inhaled your fly when the water was up. One can try to get on the water earlier, stay a bit later and tread a tad more carefully but truth be told things are tough out there. Tough enough that I just declined taking a complete novice on a guided trip, he wasn’t prepared to walk far and the prospects of quality near roadside and therefore lower altitude are severely limited. Probably would put the poor guy off fishing for life if that was to be the first encounter. Its not that things can’t be entertaining out there, it is easy to spot the fish, or at least the ones that are out on the current but it is also easy for them to see you which sort of “ups the ante”. Months of catch and release fishing have raised the awareness of the fish, the flat water has improved their ability to see you as well as the shadow of your tippet and the pockets, where one might have had a better chance of sneaking up on a fish or two, have all but been vacated. I am not sure if the fish move out for fear of getting stranded or simply because of the temperature but at some point late in the season they always seem to disappear. Pity I love pocket water fishing, it is the only place where circumstances offer some edge to the angler, all things being equal. I know that even back in the UK when rivers rarely drop as low or get as warm as those here the rivers are usually regarded as tricky in the late summer, August offering little respite during the day but perhaps a caddis hatch in the late evening. Our hatches seem to wane drastically in the heat of summer so the fish aren’t even fixated on food floating down the current when you are trying to get into position. Spooking fish becomes the norm, if you can raise one out of five that you see without scaring them into flight you are doing well. Still I reckon that when you get right down to it, it is still worth fishing, not on the lower beats, there a captured fish is likely to be a dead one if you are not very careful, the oxygen levels in the warm water put the stress of capture too close to the fatality line for me to feel comfortable fishing in those waters. But the headwaters or tail-waters still offer sport. You will catch a lot less but possibly learn a whole lot more in these conditions.. it isn’t for everyone but it still beats a day in the office. Under these conditions doing everything you can to reduce your visibility and the clean, rapid and delicate presentation of your fly is important. That means almost all presentations are now with 7X tippet and possibly 8X, the leaders are degreased with virtually every presentation to a visible fish, it doesn’t work that well but it is better than not trying. Leaders need to be long and fine, fish are spooking before the leader even touches the water on occasion, you can never improve the presentation enough to fool all of them under these conditions. Frequently a well placed tiny brassie nymph can do the trick where a dry fly won’t, and fishing without an indicator can make for some exciting guess work as to whether you had a take or not. Matting down rods to remove that high gloss finish that looks so good in the shop and is such a liability on the stream is to me an essential in high summer. Perhaps in high water during the early season it is less important, or maybe you just can’t see the fish that you are frightening to death. Right now a glossy rod is a big mistake in my book and it will make a difference. Removing your watch and any associated “bling” from flashy forceps to shiny fishing reels will aid your approach, if you really like to have the watch on your arm then at least turn it around or put some sink paste on the face to take off the glare. Sanding down your Breitling Navitimer may be going a bit far so easier just to put it in a pocket. My friend Albe made me a super little plastic box to keep my used patterns in but I have had to put it inside the vest as no amount of sanding seems to have removed its reflective qualities entirely. Careful wading is equally essential, you can still get quite close to fish if you stay in the shade along the bankside and don’t bang the rocks together. Careful wading however conversely means not using a wading staff, the bump bump bump of a pole on the rocks will see fish scatter well before you get within casting range. And finally if all else fails, lower your expectations, you aren’t going to fool as many fish and most likely not the bigger ones at this time of year. Fish slowly , enjoy the hunt and don’t expect to be walloping them by the dozens. Plus it wouldn’t hurt if you spent a minute or two praying for some rain. As my mate Greg commented, “Bring on the winter rains, I need to at least get my knees wet when I fish”.